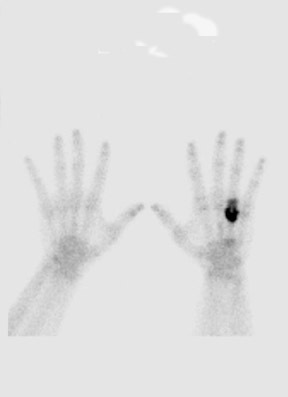 Radiography of the left hand revealed a lytic expansile epiphyseal lesion in the head of the ring ﬁnger metacarpal bone. The lesion caused cortical destruction and tiny septations with poorly visualized matrix. There was associated widening of the third and forth meta carpal spaces, which suggested a soft tissue component (Figure 1). 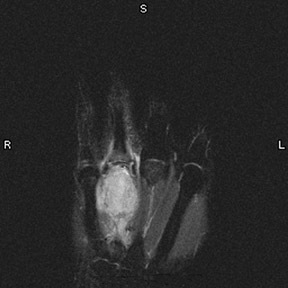 Magnetic resonance imaging (MRI) showed a subarticular expansile lesion in the head of the ring ﬁnger metacarpal bone. 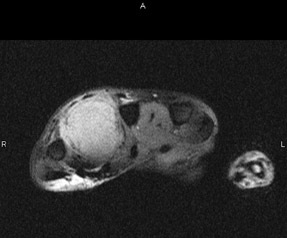 On T1-weighted imaging, the lesion exhibited a inhomogeneous low signal intensity lesion. On short tau inversion recovery imaging, it had inhomogeneous high signal intensity. There was cortical destruction with soft tissue invasion that almost touched the middle ﬁnger metacarpal bone (Figure 2, A and B). The middle ﬁnger metacarpal bone showed the normal contour and signal. The extensor tendons were effaced and exhibited the normal signal, surrounded with the abnormal bright signal that involved subcutaneous fat. The overlying skin was normal. On the palmar side there was a tiny normal soft tissue plane between the ﬂexor tendons and the expansile process. The ﬂexor tendons were normal. The subcutaneous fat on this image appeared normal. 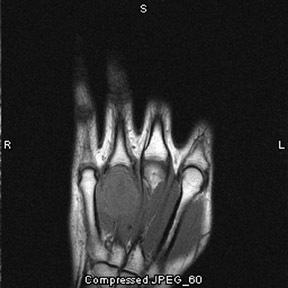 The mass on the ulnar side touched the little ﬁnger metacarpal bone, which had normal contour and signal (Figure 2C). 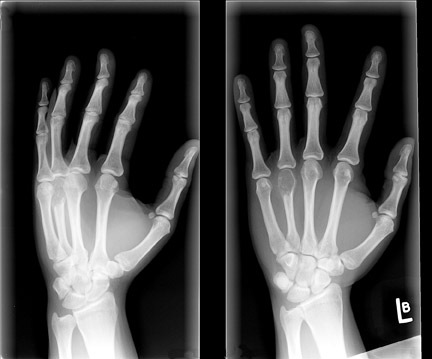 A whole-body bone scan and spot ﬁlms of the hands showed a single lesion in the skeleton located in the left hand (Figure 3). Microscopic examination showed a tumor composed of numerous multi-nucleated giant cells admixed with the mononucleated stromal cells. 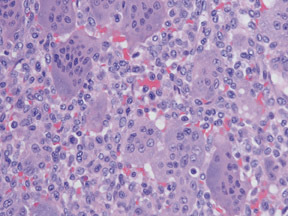 The mono nucleated stromal cells were oval-shaped and lacked atypia, and their nuclei displayed features similar to those present within the giant cells (Figure 4). Szendröi M. Giant-cell tumor of bone. J Bone Joint Surg Br. 2004; 86:5-12. Murphey MD, Nomikos GC, Flemming DJ, et al. From the archives of AFIP. Imaging of giant cell tumor and giant cell reparative granuloma of bone: Radiologic-pathologic correlation.RadioGraphics. 2001;21:1283-1309. Manaster BJ, Doyle AJ. Giant cell tumors of bone. Radiol Clin North Am. 1993;31:299-323. Biscaglia R, Bacchini P, Bertoni F. Giant cell tumor of the bones of the hand and foot. Cancer. 2000; 88: 2022-2032. Resnick D, Kyriakos M, Greenway G. Tumors and tumor-like lesions of bone: Imaging and pathology of speciﬁc lesionsIn: Resnick D, ed. 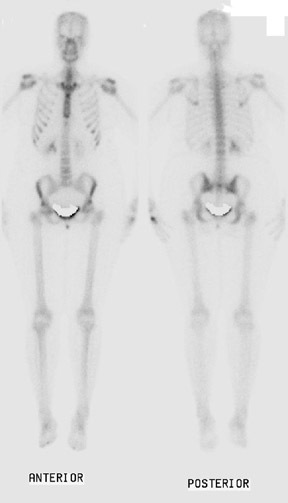 Diagnosis of Bone and Joint Disorders. 4th ed. Philadelphia, PA: Saunders; 2002:3939-3962. DeGroot H. Giant cell tumor of bone. Available on line: www.bonetumor.org/tumors/pages/page106.html.PostedApril 6, 2003. Accessed August 2005. Chang SS, Suratwala SJ, Jung KM, et al. Bisphosphonates may reduce recurrence in giant cell tumor by inducing apoptosis. Clin Orthop Relat Res. 2004;426:103-109. Giant cell tumor. Appl Radiol.